The 2017 Fiat 124 Spider is the best of all worlds; it has Italian design and performance with Japanese engineering. Our man Ballaban says it’s even better than the Miata. But I wouldn’t rush down to my local Fiat store right away, and here’s why. The biggest problem with the Fiat 124 Spider has nothing to do with the styling, the performance or the price. The issue lies with the badge on the hood. While both cars are Mazdas underneath, only one has the benefit of Mazda’s track record for reliability and high resale value. The 124 will likely suffer the same fate of massive depreciation like other Fiats. This is bad for Fiat—but good for you if you’re willing to be patient. Let’s have a look at the current market for lightly used Fiats. The 2016 500 Abarth Starting price of $23,475 with a loaded up car going for $29,134. According to Autotrader, the average list price for a used 2014-2015 500 Abarths is $17,686 with the bulk of the listings falling into the $14,000 to $17,000 range. Most one-year-old 500 Abarths are plummeting $8,000-$10,000 in value with hardly any miles on them. Since the 500 Abarth is so low volume it might not be the fairest comparison. Fiat’s best seller right now is the 500X crossover. The 2016 model price range starts at $20,000 for a 2WD Easy and maxes out at $28,335 for a Trekking Plus AWD before additional options. The average list price for a used 2016 500x is about $20,000. That fares a little better than the Abarth, but these cars are less than a year old. Even still, most 2016 500X models are listing for $5,000 to $7,000 below the original sticker. Here is a 2016 500x Trekking AWD with less than 2000 miles that already lost nearly $7000 in value and it is almost a new car! When you compare the Fiats to the Mazda Miata, the depreciation curve looks very different. The 2016 MX-5 Miata has an MSRP of $26,050 for the Sport with a Grand Touring automatic (if you must) car topping out at $32,405 before additional options. If you look at the listings for pre-owned 2014-2015 Miatas, and keep in mind this is a totally different generation and body style, the average list price is $23,511. There are some NC Miatas selling for almost as much as brand new ones. So unless you really like the previous body style, it doesn’t make much financial sense to buy a used Miata over a new one. 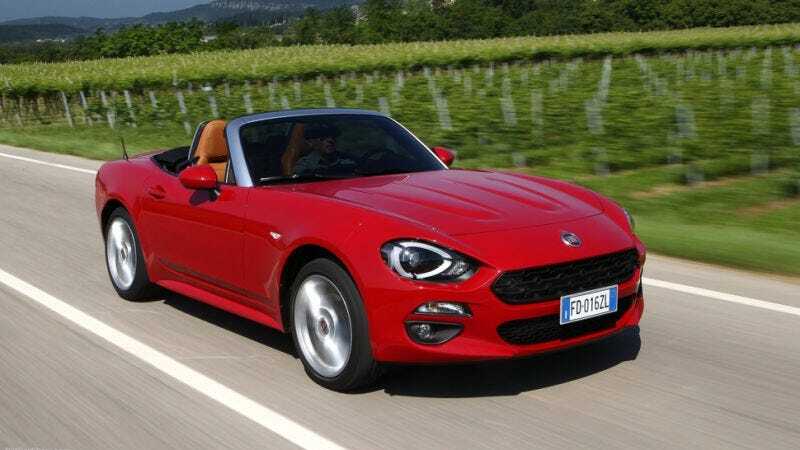 On the other hand, if the other Fiat models are any indication of the projected resale value of the 124 Spider, you might want to wait a year or two before jumping into the Italian drop top. Or you can buy a new Miata now and trade it in on a used 124 Spider later. Your pre-owned Miata might even be worth more than the Fiat.